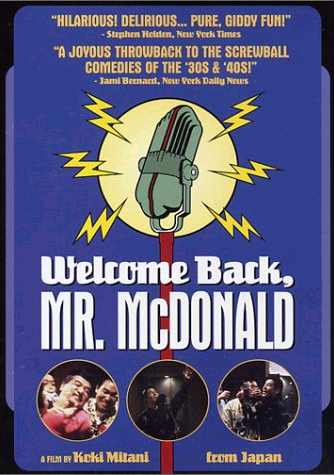 'Welcome Back Mr. McDonald' (McDonald) is a film about what goes on behind a live radio drama, 'Unmei no Onna' (Woman of Destiny). Miyako Suzuki, who's otherwise just another Japanese housewife, takes part in a drama writing competition held by a broadcasting station and wins on her first ever script. Naturally, she's thrilled that her script will be heard live on the station's midnight program, but with the show going on air soon, the show's star, Nokko, insists on changing the heroine's name, and before one knows it, everyone's changing the script -- impromptu -- even as the show is being broadcast. From Ritsuko and Torazo, the characters become Mary Jane and Peter Michael (and then Donald McDonald). From Japan, the locale is switched to Chicago. And what was a Japanese romance between a pachinko woman and a fisherman soon becomes an exaggerated melodrama involving a woman lawyer, an NASA pilot, and whatnot. The final straw for the soft-spoken housewife comes when Nokko decides to kill off the hero at the end of the story. 'McDonald' revolves around the drama behind the drama. As the cast and crew for 'Unmei no Onna' find themselves in deeper trouble with each script-change, the drama within the studio quickly overshadows what's on air, as egos clash and tempers flare, all to hilarious effect. Yong Ai Aug 16 2013 6:00 am A superb movie! First class comedy! I've watched it several times.